Yellow Cottage is ideal for one or two couples or a small family of 5; crate-trained dogs welcomed! In your booking or inquiry, please share a bit about yourself and the breed and size of your dog. VRBO recognizes the property owner/manager as a Premier Partner for consistently delivering great traveler experiences. 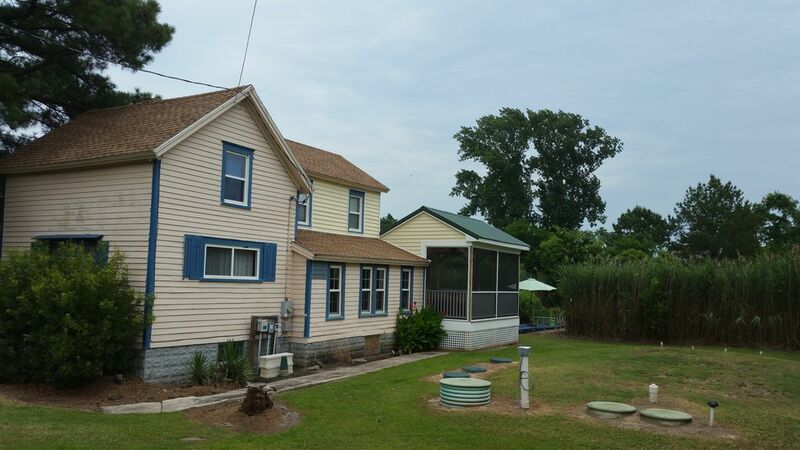 Surrounded by flowering bushes, rushes, and pine trees, and overlooking salt marshes and ponds on the quiet north end of the Island, Yellow Cottage is located 1.7 miles from historic downtown and 6.4 miles from the National Wildlife Refuge and Seashore. NOTE: pets prohibited from the Virginia side of Assateague Island, even in a car. PROVISIONS include ironed bed linens, bath & beach towels, and paper & soap supplies. Guests provide their own 16.4-oz. propane canister for the small Weber grill. AMENITIES include Central HVAC and upstairs AC, Internet WiFi, Blue-Ray DVD Player, Hulu Stream TV Shows & Movies, and Bose® Wave® music system. Paperbacks, puzzles, games, and cards. Four old beach chairs and sand toys. NOTE: no cable TV. The long side driveway parks two cars back-to-back. The front door opens to a mudroom laundry with bathroom/walk-in shower. The open downstairs layout features a kitchen, dining area, and living room. Recent renovations rebuilt the kitchen with soft-close cupboards and prep table; and new stainless steel gas range, dishwasher, and refrigerator. The new screened-in back porch features wicker seating and a dining table. Two small bedrooms sleep five (two double beds and one twin bed) upstairs. A retired artist-educator. VRBO recognizes the property owner/manager as a Premier Partner for consistently delivering great traveler experiences. Six and a half miles to the Assateague Island National Wildlife Refuge and Seashore. The beautiful seashore features the only public beach on the islands.The refuge features a spectacular variety of migratory birds, plants, and the famous wild Chincoteague ponies. Hiking and biking the miles of nature trails is an excellent way to immerse yourself in the natural beauty of the island. Front and back views of saltwater marshes and ponds feature the daily arrival of egrets and herons. One of the greatest pleasures is a tour of the island's great variety of shops and galleries. Chincoteague Island is home to a thriving artist community. Galley kitchen renovated in 2018: soft-close cabinets, prep table, and stainless steel appliances (gas range, dishwasher, refrigerator); pantry closet; well-stocked with pots, pans, and skillets. Screened in porch, newly built in 2018, features wicker seating area and a dining table.. AMENITIES: wireless Internet, central air conditioning and heating, 47"wall-mounted flat screen TV with Blu-ray disc player and streaming Hulu Plus TV Shows & Movies, Boise stereo/CD player, books, DVDs, games, puzzles, sand toys, 4 beach chairs, and bike rack. A housekeeper makes the beds and cleans the cottage between rentals. NOTE: no cable television. PROVISIONS; fresh bed linens and bath and beach towels for the number of guests staying; and, paper towels and napkins, toilet paper, dish and bath soap, and trash bags. NOTE: guests provide their own 16.4-oz. propane canister for the small Weber grill. Our stay at Yellow Cottage was absolutely lovely! The location is tranquil; just far enough out of town to keep traffic to a minimum, yet close enough to be in the heart of the island in minutes. The cottage is nestled between a lagoon and a pond, so wildlife and photo ops abound. Egrets and blue herons were everywhere, and we had daily visits from tree frogs on the dock in the backyard. The cottage was beautifully furnished with an eclectic mix of furnishings and decor.The kitchen had many amenities that made cooking and cleaning up a breeze. Our favorite "room" was the screened in back porch, which featured a dining table, rattan chairs, a ceiling fan, and the most gorgeous and peaceful wind chime I've ever heard.Our dog felt very welcome, and so did we! We would return in a heartbeat. If you love a quiet,relaxing environment, Yellow Cottage is highly recommended. Lovely and clean home located close to all the amenities you would want. A truly relaxing spot in a well-maintained home. If you like the beach vibe, this is the perfect spot to stay!! A little off the beaten path and that was terrific: nice and quiet place to stay, within a good driving distance of everything in Chincoteague & the national wildlife refuge on Assateague Island. The screened in deck was a lovely place to spend an evening. Thoughtfully decorated and equipped with all we needed for a lovely vacation. Loved mornings and family dinners on the screened in porch. The wind chimes were a lovely addition to a serene outdoor living space. Kitchen was fabulous and loved the mudroom. Would definitely stay here again. Worth it! We highly recommend Victoria's place to anyone wanting a clean, convenient and dog-friendly place to stay on Chincoteague! We found a great paved trail about a mile away and the dogs loved it. When the bathroom sink stopped draining, Victoria was there in about an hour to fix the problem. The newly renovated kitchen and screened porch were our favorite features. We enjoyed meeting Victoria, staying in her her lovely home and visiting the island. For any fans of Misty of Chincoteague, this is the place to go! If you make an inquiry or request reservation, please confirm if you are bringing pets and share a bit about yourself and guests. Ideal for 1 and 2 couples or a family of 5, Yellow Cottage is located 1.7 miles from the historic downtown causeway bridge. Flowering bushes, rushes, and pine trees surround this spacious lot that overlooks salt marshes and ponds at the quiet northern end of Chincoteague Island. Herons, egrets. and mallards on the water and warblers among the shrub thickets are a daily sight. The Salt Marsh Lane/Wildcat Road trail is just up the road. The cottage is 4 miles by car and bike from the Chincoteague National Wildlife Refuge/Assateague National Seashore. Vehicle entry fee required and pets not allowed. The Refuge is home to a spectacular variety of migratory birds, plants, and the famous wild ponies. Hike and bike the miles of nature trails to immerse yourself in the natural beauty of the island. The spectacular seashore features the only public beach on the Islands. CHECK-IN after 4 p.m. Early check-in is not available. CHECK-OUT by 11 a.m. TAXES town 4%, county 2%, and state 5.3%. PROPERTY NOTES: Upon payment 1, guests receive notes about the property attached to a VRBO confirmation message. After the second payment, guests receive access information. CANCELLATION: 100% refund with 60-day notification and 50% with 30-day notification prior to check-in date. No refunds will be given for early departure or weather-related problems on the Islands. MAXIMUM OCCUPANCY: Five including infants and children. TERMS OF OCCUPANCY: The property you are renting is a private residence. Please be respectful of the cottage and its contents, and refrain from any activity that interferes with the quiet enjoyment of nearby residents. You also agree to call us with any concerns or repair needs during your stay. We are not liable for failures of appliances or equipment but will work as quickly as possible to make repairs. We cannot foresee problems that may affect the entire Island, including sub-station power outage and interruption in internet service.